Though sometimes human genius can temporarily stay the tide. While numbers and material do not always a successful campaign make; history does show that military victory tends to go to the side with more. More men, more supplies, more (and better) weaponry, etc. Against this purely physical equation must be factored the morale and quality of the soldiers involved, the ability of their commanders, terrain, and other ”force multipliers” and intangibles that impact on the final outcome. That said, the big kid usually wins the fight. Like boxers, a larger and heavier fighter might be slower than the feisty banter-weight. In the first rounds, the quicker fighter can often land many more shots on the lumbering heavy-weight. But if his lighter blows don’t achieve a knock-out; if the big guy can take a punch, then time is against the light-weight. In a slugfest, the longer it goes on the more likely the big man will land a heavy blow; and beat the little guy down. Throughout history we see examples of smaller but better trained and led armies winning victories over a larger, less tactically adroit opponent. However, if initial tactical victories cannot be parlayed into a quick and victorious conclusion to hostilities, time tends to favor the “big battalions”. A commander of genius can be a powerful “force multiplier”. Alexander the Great, perhaps history’s greatest of “Great Captains”, was able to defeat the much larger Persian Empire with a small but elite army; doing so in just a few short years. His campaigns were characterized by rapid movements and bold action; and he possessed a gift for finding his enemy’s strategic jugular. Darius made many mistakes as well, never managing to effectively leverage Persia’s vast resources of money, manpower, and geographic space to his advantage (in his defense, Alexander was a master of overcoming such adversities). Hernán Cortés proved another exception to the rule: with an army of less than 1,000 Spanish adventurers he managed, in just two years, to overthrow the greatest power in the “New World”: the Aztec Empire. Though the Aztecs had geography, wealth, and vast numbers of savage warriors on their side; they were at a disadvantage against the bold, brilliant, and opportunistic Conquistador. Cortés used every diplomatic and religious advantage Montezuma presented him; turning his enemy’s superstitions and uncertainty as to the Spanish visitor’s true identity (Montezuma, a former priest, initially mistook Cortés for the returned Aztec deity, Quetzalcoatl ) to advantage. Cortés’ abilities as a commander aside, the Spaniards possessed other “force multipliers”: superior weapons technology (steel armor and weapons, crossbows, and gunpowder weapons); “fear” weapons, the Aztecs being terrified (at least initially) of the Spaniards gunpowder, their cavalry (horses were not native to the New World), and their large and fierce mastiff dogs (only very small breeds were known in Mexico, and these were a food source); and the ultimate “force multiplier”, germ warfare: the Spaniards inadvertently brought Smallpox to Mexico, which devastated the Aztec population. But more often history shows that of all the military advantages, “quantity has a quality all its own”. Military genius alone has a very hard time when pitted against even a mildly competent enemy possessed of greater resources of manpower and material. If you doubt that, just ask the superb generals of Hitler’s Wehrmacht about their unpleasant experience fighting the Russians on the Eastern Front! In 1941, the German war machine was a very fine-tuned one, indeed. The German Panzer Division was a proto-typical combined arms force; in which rapidly maneuvering armored forces were supported closely by mounted infantry, mobile artillery, and airpower. The vaunted Blitzkrieg strategy had conquered Poland, Denmark, Norway, the Low Countries, and France; sweeping the British off the continent in the process. The Balkans were overrun in spring of that year, and in summer of ’41 Hitler unleashed his Panzers on Stalin’s Soviet Union. Though sure of being outnumbered by “the Bolshevik hordes”, the German’s were confident in the many “force multipliers” they possessed: mobility, firepower, experience, and the talents of an exceptional officer corps. While perhaps not rising to the level of “Great Captain”, the German generals Guderian and Von Manstein were brilliant and farsighted commanders. However, Russia had the ultimate “force multiplier”: population. Germany, a nation of less than 70 million was engaging a nation of 169 million; led by a dictator ruthless enough to use this advantage to bloody purpose. Russia also had vast industrial capability; out-producing the Germans in all categories of material (and what they couldn’t readily produce, their American ally gave them in abundance). Germany was the ultimate example of the feisty over-achiever; up against Russia, the biggest bully on the block. Germany had to achieve a knock-out blow early-on, before Stalin could mobilize his vast resources. Manpower aside, Russia could also rely on two other resources: vast geographical space to trade in return for time (to mobilize and respond); and the extreme Russian weather conditions. Not just winter, which was of legendarily harshness. What proved more troubling for the Wehrmacht, which needed to maneuver rapidly in order to maintain their “blitzkrieg”, was “General Mud”: the muddy morass Russia’s roads became with the Spring and Autumn rainy season. Germany failed in its one true chance to win the war and strike knock out blow against Russia in ’41; when Hitler turned Guderian’s panzers away from Moscow in August, while there was sufficient time to capture the city before first mud and then snow brought the panzers to a halt; in order to capture the secondary objective of Kiev. By the time Guderian was back on track, the year was too far advanced and time was against the German forces. They ultimately ground to a halt within site of the Kremlin’s onion domes. For the next four years, the Germans continued to land hard blows on the Russian giant. But each time the Russian got back on his feet; while the German came away with a bruised and bloody fist. Ultimately, the “big battalions” ground the qualitatively superior Wehrmacht into dust. Other historical examples of this include Hannibal attempting with a single well led army to defeat the overwhelming might of the Roman Republic; Charles XII of Sweden leading a relatively tiny army deep into Russia against the vast resources of Peter the Great’s Russia; and Robert E. Lee and the feisty Army of Northern Virginia fruitlessly attempting a knockout punch against the lumbering behemoth that was the Army of the Potomac. In 218 BC, the city-state of Carthage began its second war against the emerging power in the Mediterranean, the Roman Republic. While itself possessed of a far-flung colonial empire, Carthage started the war with no material advantages. Her native army was small and relatively unmotivated; and was only made formidable by the hiring of mercenary warriors from far and near. Once a naval power, her fleet had been bested by the Romans in the First Punic War a generation earlier; and now Rome had both a larger and better trained army, as well as naval superiority. Rome was already a powerhouse in 218BC, with vast reserves of manpower and wealth (the sinews of war). What Carthage had in its favor was the special ability of one man: Hannibal Barca. Son of another great soldier (Hamilcar Barca), he brought to the equation an intangible factor, that being true military genius. Starting in Spain, which had been added to the Carthaginian Empire by the campaigns of his father, he started the war by aggressively seizing the initiative and invading Italy; something the Romans were unprepared for. Over the next 15 years, he and a relatively small but loyal army marched up-and-down Italy; sustaining themselves on enemy soil, inflicting defeats upon their Roman enemies. In the first three years, Hannibal won three smashing victories over as many Roman armies; each bigger than his own. In the earlier boxing analogy, Hannibal was the light-on-his-feet boxer who slips his clumsier opponent’s punches and lands three knock-down blows. But Rome could take a punch; she was nothing if not resilient. Each time, the Romans got back up off the mat, dusted themselves off and came back for more. In time, the Romans learned to avoid Hannibal’s knock-down punches. Their armies got lighter on their feet and learned to box back. In Scipio, who started the war as young aid-de-camp to his father, one of the Roman generals at the start of the conflict; Rome eventually found a commander as wily as the one-eyed Carthaginian master. At Zama, in 202 BC, Scipio the Roman heavy weight finally maneuvered the light weight Carthaginian into a corner; and delivered the knock-out punch. Hannibal, who at one point stood at the gates of Rome, was unable to force an early decision upon the stubborn Romans. The clock was not his friend; he needed early knock out. Given time, Rome’s greater material advantages came to bear and wore down their smaller opponent. In 1700, the Great Northern War pitted a coalition of larger nations against tiny Sweden. Though small, the Swedes had proven to be formidable soldiers. Led by a dynasty of warrior kings, the Vasa, Sweden had conquered and controlled an empire surrounding the Baltic Sea. The allied nations against her – Denmark, Poland/Saxony, and Russia – all wanted a piece of that Swedish Empire for themselves. The allies chose to attack Sweden at the accession of its young king, Charles (Karl) XII; who attained the throne of Sweden in 1697 at the age of fifteen. The belligerents, attempting to take advantage of the boy’s inexperience, attacked from all quarters in 1700. While possessing overwhelming numbers, they hadn’t counted upon the ”X” factor: the young king of Sweden’s natural military talent. 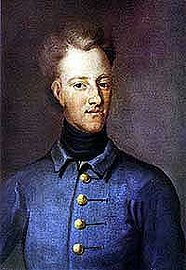 As with the young Alexander of Macedon, Charles XII was one of those rare men of native military genius, which comes to bloom at a very young age. Like the masterly Macedonian, Charles took command of his army at 18 years old in 1700, his nation beset on all fronts. He proved a daring, resolute, aggressive and ever intrepid commander. Again like Alexander, he directed his troops personally in battle from the saddle, often personally leading his bodyguard squadrons of horse in the decisive charge. Though Sweden was small, it was led by a lion! Charles immediately took the initiative; acting first against the closest of his thee enemies. Landing a force of 8,000 on the Danish home island of Zealand, Charles rapidly compelled the Danes to submit to peace in August 1700; knocking out the first of the allied belligerents. He then turned on Russia, rapidly deploying his forces across the Baltic to Swedish Ingria, then facing invasion by Russian forces. The Russia of 1700 was only newly emerging into the modern age. Under its young Czar, Peter I (not yet “the Great”) it was attempting to take its place among the power of Europe, at Sweden’s expense. Peter possessed a large army, levied and newly trained by Western European military advisors. However, it was an untried force, large and clumsy in execution. Peter himself, though an active and enthusiastic amateur, lacked Charles’ personal courage in battle. Time-after-time he would flinch or flee from personal hazard; leaving his army leaderless and demoralized when facing his Swedish nemesis. He and his vast nation, Russia, were comparatively an enormous mouse. Charles met and defeated the much larger Russian forces first at Narva, in October 1700. Here, Charles led his army of 10,000 men forward against three-times as many Russians, defending breastworks of a fortified camp, in the midst of a blizzard. Czar Peter, conversely, fled the field as the first blows were falling! The Russian army was utterly crushed, losing 9,000 dead and another 20,000 captured! For the next 6 years, Charles turned his attentions on Poland/Saxony; chasing its king, Augustus the Strong (! ), throughout his dominions till forcing his abdication in 1706 from the Polish throne and a termination of his alliance with Russia. But these six years spent thrashing Augustus was a strategic mistake. It gave Peter and Russia time; to draw upon her vast manpower resources to rebuild and train an army capable of facing the much feared blue-coated Swedish veterans. When Charles launched his long-delayed invasion of Russia, he commanded the largest army Sweden would ever field in this war: 20,000 infantry and (reputedly) 29,000 cavalry (many of these were Polish light cavalry irregulars). However large this force was, Mother Russia had supplied the Czar with much larger battalions. As Charles army marched through Poland toward the Russian border, 70,000 Russian troops were in the country, retreating and laying waste to the countryside before him. Several other Russian armies, none smaller than 40,000 men, were operating in the Baltic States and in the Ukraine, as well. Charles managed to defeat the Russians in several small engagements as he advanced; and won his last victory over the Russians at the Battle of Holowczyn in July, 1708. But time and distance was working against him: Russia could always trade the one for the other; playing for time to replenish its “big battalions” by trading space, ever retreating into the depths of Russia. It was a problem both Napoleon and Hitler would wrestle with, no more successfully than Charles. The vast spaces and a harsh winter depleted Charles’ army. In Spring of 1708, in need of allies, he marched into the Ukraine at the offer of alliance with the Zaporozhian Cossacks; in revolt against the Czar. But the Russians managed to crush the Cossack rebellion before Charles could arrive; and the Swedish King’s army faced a much larger Russian force at Poltava in June 1709. Charles’ army of 14,000 men advanced against a well prepared Russian force, 45,000 strong in a well entrenched position; supported by nearly 100 guns. Charles, wounded in the foot a few days earlier, could take no part in the battle; and was forced to watch the battle from the rear in a litter. His bold Swedes pushed forward with great gallantry, capturing several of the Russian redoubts with bayonet. But the biggest battalions began to wear them down; and as the Swedish advance lost momentum, the Russian went over to the offensive. The Swedes were cut down or forced to surrender; Charles himself being carried off the field to safety. Genius and daring, ultimately, were no match for shear weight of numbers and resources. Charles had an opportunity after Narva to follow-up his victory and perhaps force Czar Peter to favorable terms. His sojourn in Poland had squandered that opportunity. The tiny Swedish lion was ultimately crushed by the enormous Russian mouse. By contrast, the Army of Northern Virginia was over-flowing with fighting spirit; from its dirty, ill-clad enlisted men all the way up to its superbly confident and aggressive commanders. Such generals as Thomas “Stonewall” Jackson, A.P. Hill, Jubal Early, James Longstreet, and of course its Commanding General, Robert E. Lee were among the best leadership teams ever gathered together under one command tent in American history. Outnumbered and outgunned by their Federal opponents, the Confederate forces relied on the one thing they had in abundance: courage and aggressive spirit. Time and again, Jackson and Lee bested larger Northern armies. Jackson’s Valley Campaign and Lee’s Seven Days Battles are masterpieces of aggressive maneuver, and textbook examples of seizing the initiative; of keeping a larger, lumbering enemy constantly on his back foot, off balance and forced to react. But Lee was perhaps keenly aware that the uneven struggle could not continue to go his way indefinitely. He needed to strike a knock-out blow before the Confederacy was worn down by its bigger opponent. He attempted twice to achieve this the only way it was possible: by carrying the war into the North and forcing Lincoln to sue for peace. His first invasion of the North, in 1862, began promisingly with the Confederate Army of Northern Virginia advancing into Maryland on several convergent lines. Lee’s objectives were first the Union supply and communications hubs of Harrisburg and Baltimore (taking Harrisburg would have severed the man rail lines connecting the eastern and western United States, while capturing Baltimore would cut off Washington DC from the rest of the North); followed, ultimately, by isolating Washington, DC, and forcing the government to terms. Another described Lee’s confident veteran troops as “a lean and hungry set of wolves“! An often bewildered McClellan’s was slow-to-react, despite the large numeric and material advantage enjoyed by his Army of the Potomac. Only a stroke of fate perhaps saved the Union from defeat in ’62. A set of orders from Lee to his subordinates, outlining his plan of campaign and the dispositions of his divergent forces were accidentally dropped by a dispatch rider, concealed within a bunch cigars. These were discovered by Union soldiers and delivered to McClellan. Armed with his adversary’s plans, even so cautious a general as McClellan was moved to action! In the resulting Battle of Antietam, Lee’s invasion was brought to a halt in the bloodiest single day of fighting in American history. Backed by the bigger battalions, McClellan could afford the losses; Lee could not. His army was forced to withdraw back into the South. The second invasion, in 1863, followed nearly the same line of approach and the same objectives. This time, the Army of Northern Virginia butted heads with the Army of the Potomac at Gettysburg, in Pennsylvania. The “high water mark” of the Confederacy, Lee’s “lean, hungry wolves” broke their teeth upon the Union defensive lines along the high ground, well supplied and supported by artillery. Failing twice to win a knock-out, Lee spent the rest of the war on the defensive; attempting with varying degrees of success to slip the punches of his overwhelmingly bigger opponent; which, under the command of U.S. Grant had found a commander unafraid to spend lives to achieve objectives. At last, forced into a corner with nothing more than a dreadful pounding to look forward to, the Army of Northern Virginia surrendered at Appomattox in 1865. While history demonstrates examples of the smaller, more nimble army winning stunning victories against a larger and slower opponent; far more often war comes down to a bloody mathematical equation. As in professional football (American, not the other kind) bigger is nearly always better. This is a lesson that American military and political leaders should bear in mind. Our forces have, over the last two decades, been continually downsized; the large, “heavy” divisions demobilized in favor of smaller, more nimble combat brigades. The arguments for this seem persuasive: that we no longer face the prospect of armored conflict against the Soviets on the plains of Germany. That smaller forces, armed with more advanced and lethal equipment, are just as deadly as the older, larger formations with less lethal equipment; and far more deployable by air or sea. In a short and sharp encounter with limited objectives, this argument holds water. However, war is the province of uncertainty. Wars seldom turn out the way the planners originally envisioned them. If a short encounter bogs down into a bloody slugfest, even against an enemy with inferior or out-of-date equipment, and terrain does not favor rapid maneuver and numbers can translate into staying power; then a light “nimble” force can be cornered and pounded into submission by their more lumbering opponent. Today we face potential enemies in China, North Korea, and Iran; possessed of large conventional forces and large reserves of manpower. Considering the nature and history of these regimes, we can surmise that they also possess a ruthless willingness to expend these reserves in order to achieve their objectives. While we, by contrast, are notoriously “casualty adverse” and continue to reduce the number of combat brigades we have available; making the loss of any one of these catastrophic. At end of the civil war that brought him into power, Augustus Caesar downsized the Roman army from 78 legions to a “peace dividend” force of 25 legions. This force was tasked with defending an irregular and insecure border that extended from Egypt to the English Channel; from the Atlantic to the Euphrates River; around various independent kingdoms and tribal areas in the Balkans and Anatolia; and along the line of the Rhine River, facing the formidable Germans. Additionally, at various times and places Roman arms were called upon to enact punitive expeditions against or to expand the Empire into foreign lands. The superiority of the Roman legions in battle was unquestioned. Roman training, equipment, organization, and leadership were all “force multipliers” that seemed to guarantee battlefield victory. This confidence underpinned Augustus’ cost saving measures of shrinking over-all force strength to a mere 28 legions. 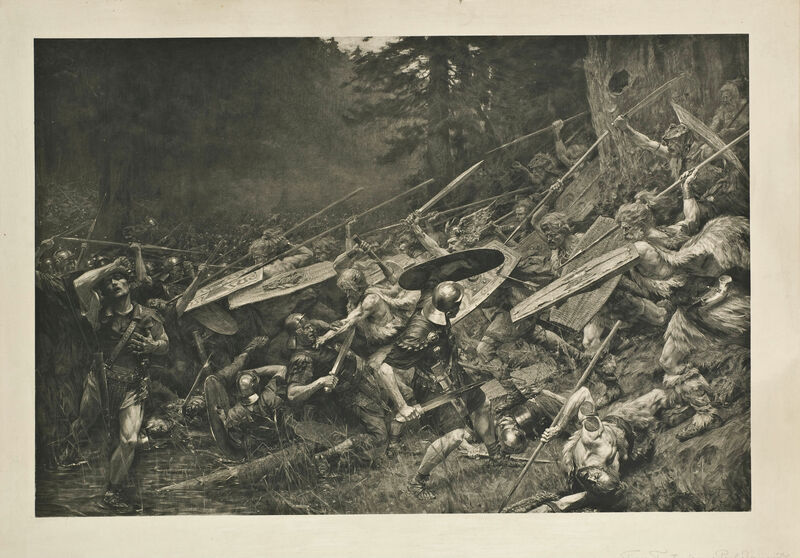 Teutoberg Forest was not the worse military disaster suffered by Roman arms. The loss of 16-20 thousand troops, while a signal loss, was trivial when compared to such truly significant defeats such as Cannae; where Hannibal utterly destroyed a Roman army of 80,000. Or at Arausio, where an even greater number of soldiers were lost. After the former defeat, the Roman Senate had forbid public demonstrations of grief or despair; and simple raised another army as large the following year. So what explains Augustus Caesar’s severe anxiety after Teutoberger Wald? Simply that in Augustan Rome’s downsized, shrunken military structure those three legions represented nearly 17% of the entire legionary force. Unlike the Republic during the second Punic War, when the warlike Roman people could generate legions of motivated and trained citizens by the tens of thousands; the Romans of the Augustan empire were now a nation of pampered and privileged civilians; protected by a small professional army of volunteers. A small army of light, mobile brigades is ill-suited to a slugging match on the Korean peninsula, the deserts and mountains of Iran, or on the beaches or fields of Taiwan. We perhaps put too much faith in such “force multipliers” as technology, training, and information; and forget, at our peril, that God tends to favor the Big Battalions. I think many unfair things have been said about Huma Abedin, wife of disgraced former Congressman and current Mayoral Candidate Anthony Wiener; and some allegations should be discarded as unproven at this time. circles in which she travels and has deliberately inserted herself. An intelligent, well-educated, and ambitious young woman, she hitched herself to a promising young prince of the Democratic power structure – hoping to rise, as her mentor (Hillary Clinton) did, to a position of power and influence – only to find out she had married an embarrassing self-indulgent, compulsive narcissist [I am being polite] who is addicted to other things more despicable than political life and power. self-respecting wife would have done by this point. of his life, is ill suited to almost any other pursuit, unless it would be as a lobbyist. If he had done that, or slid into some patronage appointment, or staff position he could have survived, made a comfortable living for himself, and taken care of his family financially and otherwise for the rest of his life. Instead, like drug addict fleeing his detox program, he re-asserted himself into the public spotlight, presenting himself as a reformed man, and asking the voters to give him one more chance in elected office. Then, it turns out, as he must have known it would, that he is not reformed, but in fact is more addicted to the behavior which got him into trouble and disgrace in the first place…..And he still hopes the Democratic Party and voters of NYC will embrace him and forgive him – as his wife says she has. Friend of Chuck Schumer or no, what planet does this guy live on? Whatever planet it is, as long as he is in the public spotlight, he is taking his wife with him. She may believe it is impolitic and impolite to slit her husband’s throat in public, but he has to go to sleep sometime. I suspect, after a suitable mourning period for the death of Wiener’s latest political gambit, she will quietly divest herself of his worthless mangy carcass either officially [by divorce] or unofficially (by a pronounced separation); again in the mold of her mentor. Perhaps Ms. Adebin should have known her marriage was doomed from the start when the interfaith marriage ceremony was “officiated” by that paragon of marital behavior: Bill Clinton. As we enjoy our 4th of July celebrations, take a moment to reflect on those quaint men in powdered wigs men who gathered together back in Philadelphia in 1776. We all have heard of John Adams and Benjamin Franklin; John Hancock and Samuel Adams (the only one to have a beer named after him). Five signers were captured by the British in later battles, and became prisoners of war. Twelve had their homes ransacked and burned. 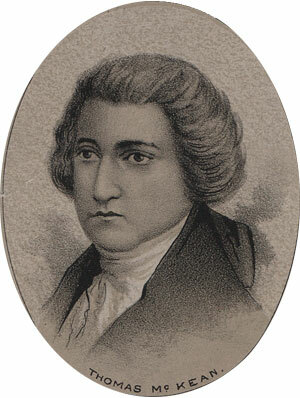 Richard Stockton of New Jersey had evacuated his family to New York, where one night he was dragged from his bed by local Tories and jailed at the infamous Provost Jail like a common criminal. John Witherspoon, also of New Jersey, lost a son at the Battle of Germantown in October 1777. Another, Abraham Clark, had two sons captured and imprisoned on a British prison barge. Nine of the 56 served in the Continental Army and died during the course of the Revolutionary War. from the seas by the British Navy. He was forced to sell his home and properties to pay his debts. He never recovered his fortune. family was kept in hiding. Soldiers looted the properties of Ellery, Hall, Clymer, Walton, Gwinnett, Heyward, Rutledge, and Middleton. Norris and Livingston suffered similar fates, there property appropriated for military use. John Hart was driven from his farm and forced to hid in forests and caves for a month. His fields and his gristmill were laid to waste. wife on Long Island for several months, and though released her health continued to deteriorate. She died a few years later, never fully recovering from her ordeal. At the battle of Yorktown, Thomas Nelson pointed out his own house to American gunners, suggesting that as it was the finest in the town, it no doubt had been taken and was being used by British General Cornwallis as his headquarters. He urged the Marquis de Lafayette to open fire upon it. Several British officers dinning within were killed by the cannon fire. tell about the battles of the Revolutionary War. 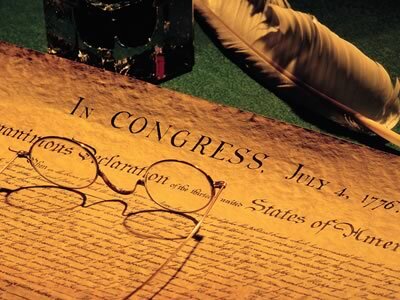 But they don’t always tell the full story of these brave men who risked everything to stand up for liberty, against their own government; the most powerful empire in the world at that time. Some of us take these liberties so much for granted…We shouldn’t.